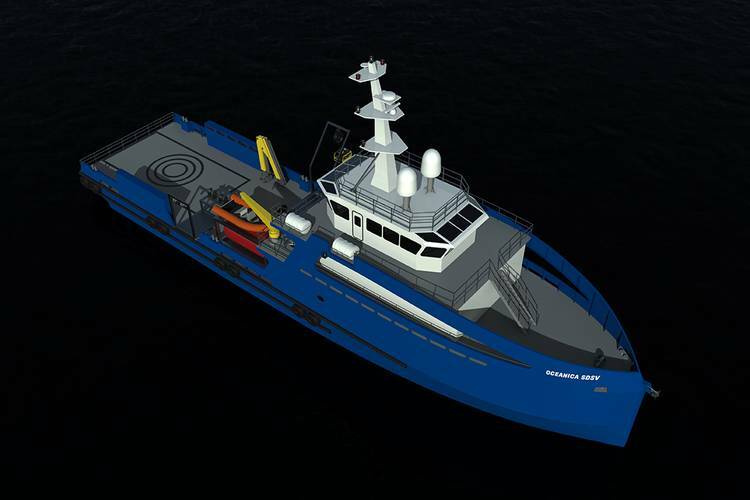 A pair of 43m Monohull Dive Support Vessels has been designed by Incat Crowther, with input from the builder and operator, to meet RINA class requirements for special service, diving and dynamic positioning. The vessels are currently under construction at Arpoadar Engenharia, in Guaruja, Brazil and will be delivered to Oceanica Offshore for service in Brazil with Petrobras. The aft main deck features a large working deck to house the Hyperbaric Chamber, Dive Bell Crane, Portside Deck Crane and ROV Crane. Inside the main deck house are functional areas including a dive operations office, a workshop, two toilet spaces, laundry room, TV room, lunch room, galley featuring space for large walk-in cooler and freezer, pantry and dining/meeting room. On the mid deck, outside cabin features a davit crane for a rescue / workboat, a waste storage area and anchor winch. Crew quarters inside the cabin accompany 12 crew members. Each stateroom features bunks, desk, lockers and en suite bathrooms. 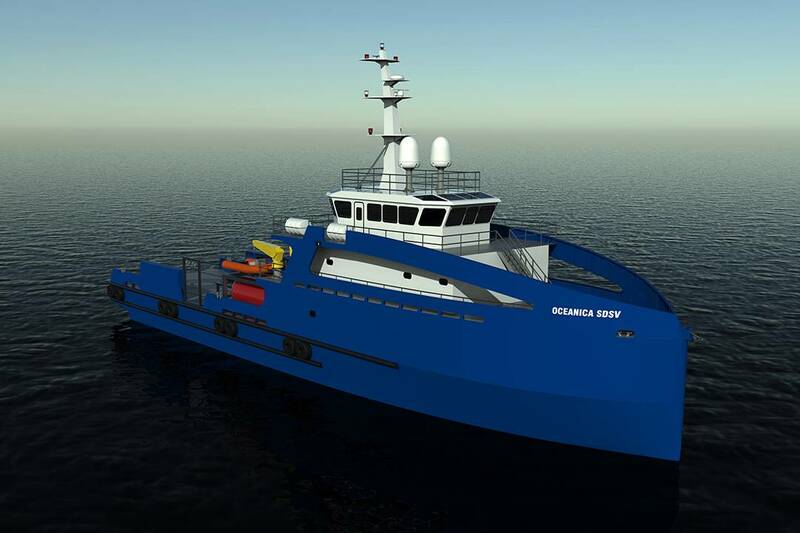 The upper deck houses a spacious wheelhouse, with forward and aft facing vessel control stations and a desk wrapping around the stairwell for workspace. Aside from perimeter windows providing 360 degree visibility, overhead windows are also fitted both forward and aft for increased visibility around offshore structures. Below decks are accommodations for the remaining 24 crew members with six four-berth cabins. All accommodation cabins feature bunks, desks, lockers and en suite bathrooms. The amidships portion contains a large machinery space housing compressors, pumps, main switchboard and other diving support equipment. A sizeable engine room and a waterjet compartment are located aft. The vessels will be powered by four Cummins QSK-19 main engines, each producing 492kW. The vessels will be propelled by four Hamilton HM-521 jets. The waterjet propulsion has been selected to reduce diver risk, the designer said. Electrical power will be provided by three Cummins QSM 11, 300 ekW gensets plus one Cummins 6BT5.9, 92 ekW emergency genset. Two Rodriquez 150kw tunnel thrusters provide maneuvering and station keeping power. 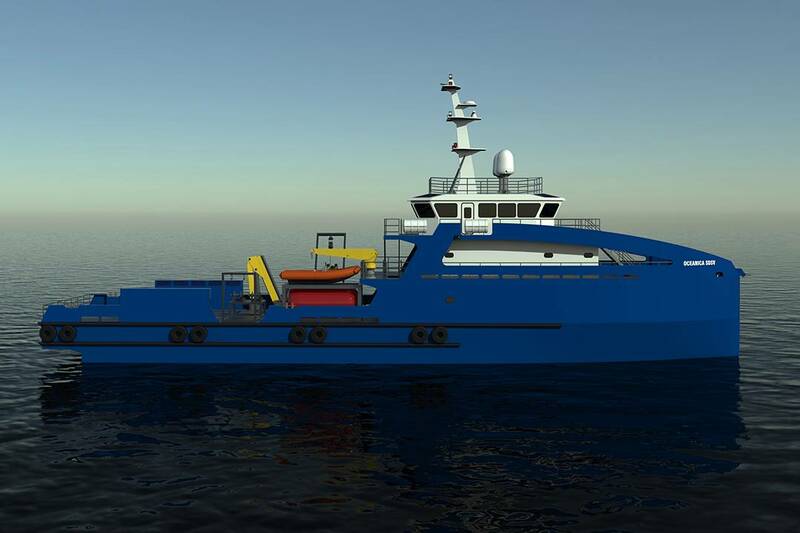 The vessels will have a service speed of 12.5 knots.